Indonesia Tour, Bali TV & Last Day of the Tour – Day 10 (30th Apr 2011) | Realise the World! Last full day, before we head off tomorrow, so I’ll make this a short one. The TV crew from Bali TV never showed as anticipated the night before to film our performance at Gayatri. However we find out that it is due to the fact that they were not able to lug all the light and sound gear from Denpasar up to Ubud. We therefore find out that we have a morning slot on the program Sehat Harmoni Indonesia, the topic of which will be ‘Living in Harmony with Sahaja Yoga’. Tired as we are, and anticipating a quiet morning, we are of course naturally delighted. It’s what we are here for, and this is a great opportunity. The program is a chat show with guests on the couch or in this case, guest speakers sitting cross-legged on the floor with the presenter Made Sukadana Karang. Bali TV is one of the main local networks and the program is being beamed live around the whole of Indonesia and other parts of Asia. We have an hour segment of interactive dialogue from 10-11am, and need to be there at 8.30am to set up, so we set sail from Ubud just after 7am. We arrive at the studios just before 8.30am and setup. 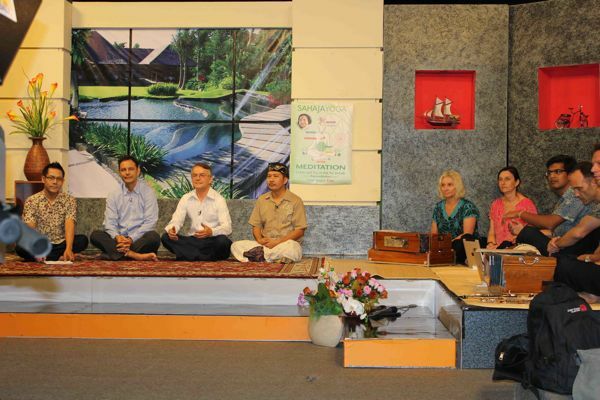 The style of the program will consist of Bhakti provising musical insertions, between the chat show, featuring Dr Craig Armstrong talking about the Medical aspects of Sahaja Yoga and Chris Szydlowski discussing the benefits to individuals, the family and society as a whole. Both Chris and Craig do tremendously giving a very professional and heartfelt presentation of Sahaja Yoga. Pak Nyoman from the Denpasar collective who has been instrumental in organising our appearance, also shares the stage and answers Made Sukadana’s questions in Indoensian. Pak Nyoman is wearing traditional balinese dress and it provides a nice contrast to the Western attire of Chris and Craig, testimony to the globalisation of Sahaja Yoga. It’s a job well done by all. Further strong connections are made with media channels in this part of the world and we have material that we can recycle for use in promotions and broadcast advertising in the region on future occasions… such as promoting the next tour there, or indeed for the local collective to promote programs. We enjoy the return bus journey. Back in Ubud we have the rest of the day to enjoy, experience Ubud, get any last minute things and sample delicious cuisine at another local restaurant. Sameer gives us all a lesson on powerful bargaining. Ramaa and I see a a lovely pair of bronzed cast statues of Shri Krishna and Shri Saraswati that would be perfect for the buffet and add to the luggage weight but even though collectively we are well overweight with the musical equipment, we get through without having to pay any excess baggage costs. Reflecting on our time there were so many beautiful experiences. The bigger concerts where we were on stage for the evening performances were all very different. Yet I think the ones which touched us the most were the grass root acoustic sessions where we really got close and personal with the local people, at the school, the birthing clinic and with the elderly group in the park. It was these programs which brought the greatest satisfaction because we really integrated into the community and were building real and potentially long-lasting relationships. A big thank you to everyone who supported the tour financially, vibrationally and via resources. It was an amazing 10 days and we are already hungry for more.